This shot is an old favorite of mine. 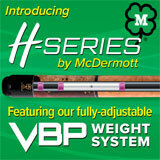 The first time I saw it was on a video where Mike Massey performed the shot effortlessly with his massive stroke. When I first saw it, due to the quality of the video, I was so perplexed as to what was actually happening. 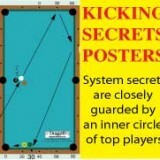 As in the diagram, you use a striped ball to shoot a cue ball into the far corner. 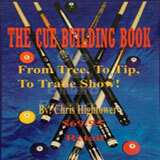 Then, you use a second cue ball to shoot the striped ball straight up the table. 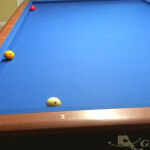 When the striped ball hits the short rail, it shoots over to the left to pocket a ball in the side pocket. 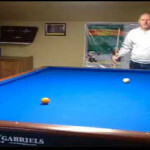 What the video didn’t reflect, due to the pixilation, is that the striped ball was spinning madly. 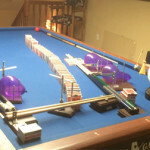 So, when it strikes the far rail, it jerks over to the left. 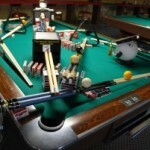 To perform the shot as diagrammed, shoot the first shot using the striped ball to pocket a cue ball in the corner. 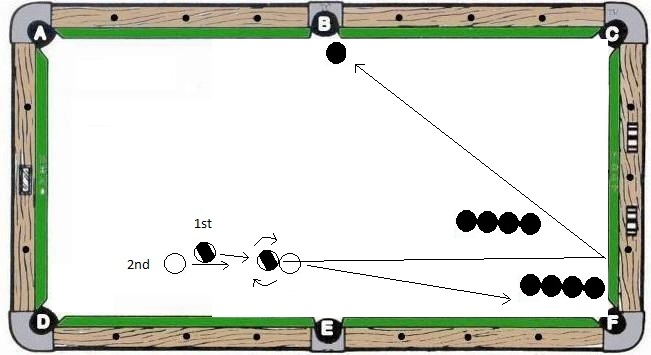 Shoot this shot with a lot of left spin and a touch of draw so that when the cue ball fires into the corner, the striped ball sits planted in one spot but remains spinning quickly to the left. 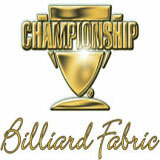 While it spins, use another cue ball to shoot the striped ball to the rail at the far end of the table. 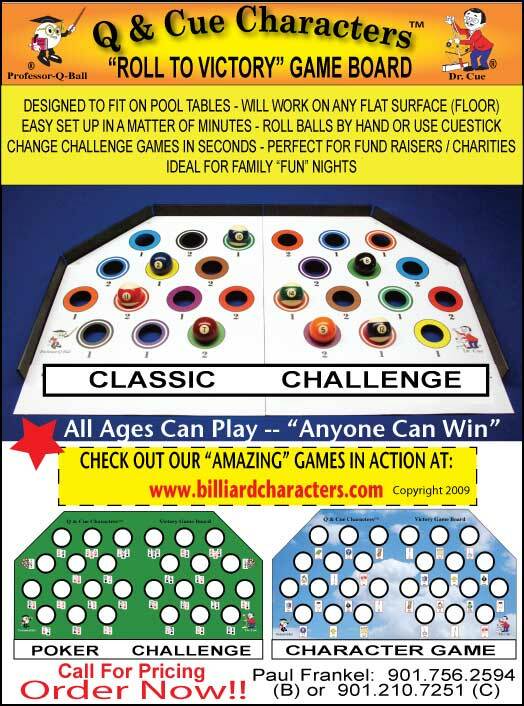 This shot is great for shows because to leave the ball sitting and spinning, by itself, is impressive to most. 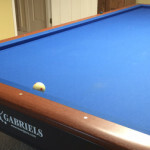 Then, the second shot, which should be shot relatively softly, is sent directly down the table, parallel to the long rail. The audience is left wondering for a second or two what is going to happen. 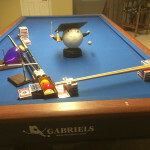 Then, when the striped ball hits the short rail, the spin and the friction between the ball and rail cause the striped ball to shoot to the left towards the side pocket. 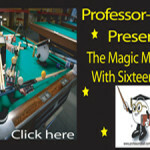 When you’re learning this shot, you might try just making a ball in the far corner pocket instead of the side pocket. 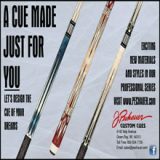 To show off with a greater make percentage, use a rack in front of the ball at the side pocket so you have a bigger target. 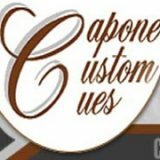 Once you get the hang of the shot, it should become pretty easy. 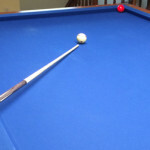 The most difficult part is stopping a spinning ball, but that becomes second nature with practice. 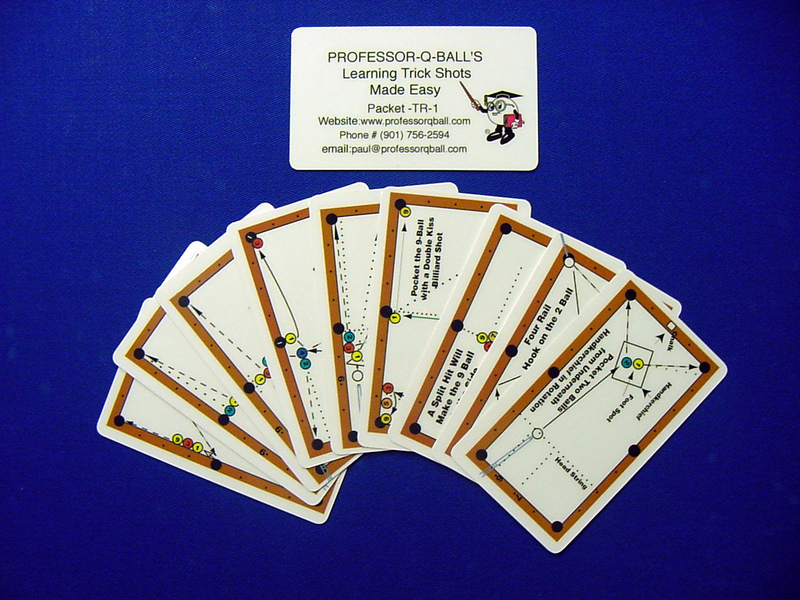 (Interestingly, that is one skill that will never prove itself applicable in standard gameplay.) 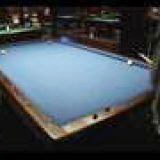 When you perform this shot, demonstrate its difficulty by showing how difficult it is to spin a cue ball off of the short rail and get that kind of angle. 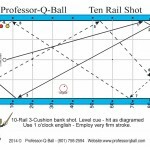 If you’re good at performing the shot as diagrammed, you can make it more difficult by adding balls or changing the angle. 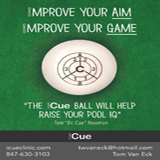 To get even more spin, try putting right spin on the cue ball that strikes the striped ball!